While much of the U.S. is still experiencing summer-like temperatures, there’s no doubt about it – fall and winter are fast approaching. If you’re in the lawn care business, that means it’s time to think about preparing your customers’ lawns for Spring 2019. And that preparation should include a fall fertilizer application. All turfgrass lawns in the U.S. go through some level of winter dormancy before “waking up” in the spring. To prepare for that dormancy period, the plant’s physiology transitions from an actively growing state to one where it’s storing carbohydrates for later use as an energy source. Growth at the shoot level decreases and root growth increases, making it possible for the plant to increase its energy reserves. 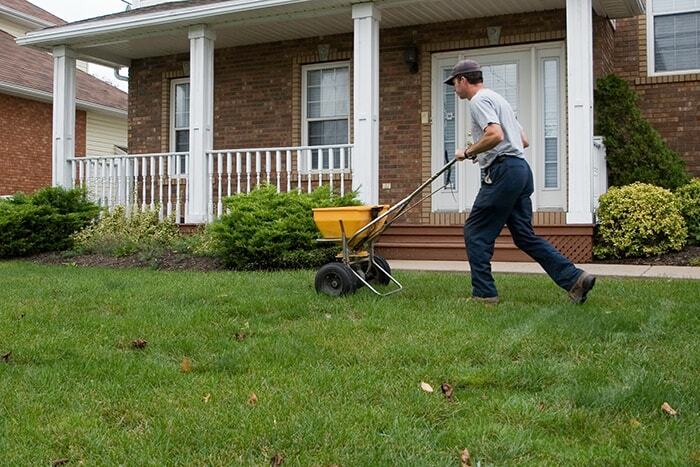 By fertilizing lawns in the fall, you’re providing the turfgrass with nutrients it can store away for the next growing season. Sarah Mack, sales and operations manager for Central Services Co., Inc. of Waukesha, WI says that fall fertilizer applications help her customers’ lawns get as healthy as possible before the grass goes dormant. Choosing the right fertilizer is integral to a successful fall fertilizer application. That said, you shouldn’t necessarily apply the same fertilizer formulation in the fall as you did in the spring. In the spring, you’re trying to grow more grass shoots; in the fall, you’re seeking better root establishment. According to Derrick, Koch Turf & Ornamental’s Enhanced Efficiency Fertilizers, or EEFs, can provide proper fertility slowly over an extended period of time to assist with the root development process. He explains that EFFs extend the longevity of nutrient delivery, giving turfgrass roots more opportunity to absorb them as needed. So long, in fact, that some lawn care managers have been able to reduce or even eliminate early spring or “break dormancy” fertilizer applications. Central Services Co. has used Koch’s UFLEXX® stabilized nitrogen fertilizer for more than 16 years. The company wasn’t happy with the product it was using previously, and Mack’s supplier suggested trying UFLEXX fertilizer. Mack says the formulation Central Services Co. uses on its customers’ lawns depends on the year and the lawns themselves. If the lawn is struggling after the hot summer months, they choose to put UFLEXX fertilizer down in its granular formulation. While everyone agrees that applying fertilizer in the fall is a good idea, there are complementary services and practices that can also happen at the same time, helping improve revenue and results. For example, core aerating a lawn before applying fertilizer in the fall provides more air to the turf’s roots so that they can properly exchange the necessary gasses to function. Applying a weed control product in the fall can also reap many benefits. However, as with fertilizer, timing is critical. There’s another reason to combine a pre-emergent application with a fall fertilizer application. While weeds tend to thrive during the warm summer months, fall’s cooler temperatures weaken them, making them more susceptible to herbicides. The most significant benefit of a well-timed, quality fertilizer application? Happy customers whose lawns inspire envy throughout the neighborhood.